How to Open and Read EPUB Book with Calibre? 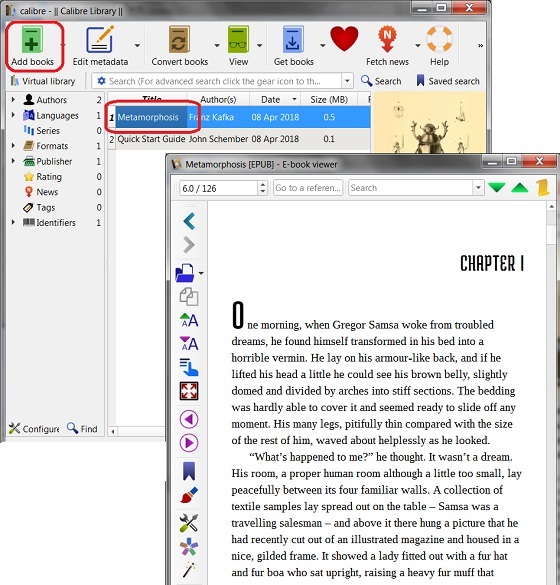 You can follow this tutorial to Open and Read EPUB Book with Calibre on your Windows computer, if you have "The Metamorphosis" EPUB book downloaded at \fyicenter\Metamorphosis-jackson.epub. 1. Search and run Calibre on your Windows computer. You see the Calibre main screen. 2. Click "Add books" icon. You see the open file screen. 3. Locate and select \fyicenter\Metamorphosis-jackson.epub. You see "The Metamorphosis" EPUB book added to the library. 4. Double-click "Metamorphosis" in book library. You see the book content displayed.